Congratulations to manager Neil Young who has been named Evo-Stik Northern Premier League Manager of the Month for December. The Blues have won three and drawn one of their four games during the month. Northwich manager Andy Preece steered his side to the same record but all their games had been played at home. Three of Chester’s victories have come away from home which was enough to justify the award. Young will receive his award prior to the Hednesford Town league fixture on the 21 January. Michael Powell and Wes Baynes have received three match bans following their red cards at Northwich Victoria on Monday. Both will miss the matches against Ebbsfleet United (FAT A), Hednesford Town (H) and Mickleover Sports (H). 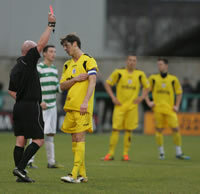 Iain Howard, sent off at Marine for a second yellow card receives a one match ban against Nantwich Town on Monday. Chester intend to appeal against the Powell sending off but only after they’ve seen the referee’s report and any video footage. Captain George Horan and Matty McGinn both return from suspension on Monday. Chester remain top of the league following Monday’s feisty derby with Northwich Victoria at the Victoria Stadium. Wes Baynes gave Chester an early lead from a free kick after home ‘keeper Ben Hinchcliffe had been given a straight red card for handling the ball yards outside the area as Chester counter attacked. Although controlling much of the game, the Blues failed to really test stand-in goalkeeper Lewis Short and their numerical advantage was lost when captain Michael Powell was given a red card following an altercation with Vics defender John Disney eight minutes before the break. Neither the referee or his assistant ten yards away saw the off-the-ball incident but the other assistant 60 yards across the other side of the field appeared to confirm the incident. The home side switched their goalkeeper again at the break with midfielder John Ruddy taking over between the sticks but the nearest the Blues came to a second goal was when Ruddy himself pushed a cross onto his own bar. The equaliser came 12 minutes form time as substitute Ryan Wade scored at the back post with his first touch as the Blues defence failed to clear a long throw into the box. Seven minutes from time Chester were reduced to nine men as Baynes saw red following a two footed tackle. Despite appeals for a Vics penalty the Chester rearguard held firm to claim their point. Chester have now been given up to 500 extra terrace tickets for Monday’s match at Northwich Victoria. Tickets are on sale at Northwich Victoria, those intending to buy on the day are urged to get to the stadium early to avoid congestion. Chester have announced that, at 11.00hrs this morning, a limited number of tickets now remain for the match at Northwich Victoria on Boxing Day. There were only 50 seats and 200 terrace tickets left this morning out of the 1,500 allocation given. The club think it unlikely that any more tickets will become available for the match. If any unsold tickets are left will be available to purchase on the day but supporters are urged to buy, and possibly collect, their tickets in advance from Northwich if they can. Ten-man Chester pulled off a crucial victory at Marine on Saturday to move three points clear of local rivals Northwich Victoria who they travel to play on Boxing Day. Marine started well and took the lead as early a the third minute with a superb free-kick by Thomas Moore. Two great saves from John Danby ensured the scoreline didn’t change and the Blues drew level through Wesley Baynes two minutes before the break then took the lead through a Matty McGinn penalty five minutes into the second half to the delight of the 900-1,000 away support. Five minutes later Iain Howard was dismissed following a second yellow card, coach Gary Jones also appeared to be sent to the stand but the Blues defence held firm to thwart a decent Marine side. 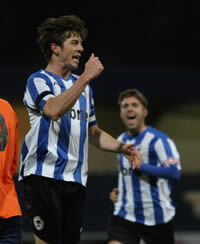 Chester boss Neil Young said after the win: “I’m delighted with the result and all credit to the players. We played most of the second half with 10 men so the lads had to work very hard to get the three points. Marine, we mustn’t forget, were only nine points behind us going into the game so it’s a big result as it pushes them a little bit further behind. Tomorrow’s match at Marine is subject to a pitch inspection at 10.30. With the temperature expected to be above freezing tonight the home club are confident to the game will get the go-ahead. Should the match be on the admission prices are: £9.00 for adults and £5.00 concessions, with children aged 11 and under free if accompanied by an adult. Segregation will be in place and admission to the ground for Chester FC supporters will be via turnstiles 1 and 2 on College Road. It’s all change on the Northwich ticket fiasco front again. Match tickets will now be available to purchase from Northwich Victoria on the day of the match. Supporters are warned however to leave plenty of time before the kick-off as you will first need to queue up to purchase a ticket before queuing up again to enter the turnstiles with it. There is no cash admission at the turnstiles. Tickets can still be bought and picked up in advance from Northwich prior to the Boxing Day match. No tickets will be on sale at Chester. Chester have been drawn away to Conference side Ebbsfleet United in the second round of the FA Trophy. The match is due to take place on Saturday 14 January 2012. The Fleet currently lie 16th in the Conference with a current home record of W3 D5 L5. 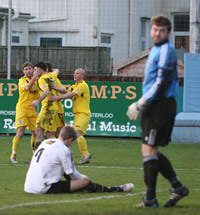 They reached the second round stage following a 5-2 victory at Truro City on Saturday. In October they suffered a shock 2-0 FA Cup exit at the hands of Redbridge a side three divisions below them. The away league match at Kendal Town has been moved back by the league and will now take place on Tuesday 3 April. Goals from Matty McNeil (pictured), Iain Howard, Antoni Sarcevic and a brace from Michael Wilde gave the Blues a comfortable 5-1 victory over North Ferriby United to send them into the second round of the FA Trophy. The Blues also saw Matty McGinn miss a penalty and had another goal disallowed for offside. Chester travel to East Yorkshire tomorrow to face North Ferriby United in the first round of the FA Trophy. The two sides met back in September with the Blues notching a 6-0 home victory. The Villagers have since installed a new management duo Billy Heath and Bobby Carroll and seen an upturn in form over recent weeks which culminated in a home 3-2 replay win over Conference North side Corby Town in the last round to reach this stage of the competition for the first time in the club’s history. Manager Neil Young will again be without the suspended George Horan but on loan Fleetwood Town defender Jack Duggan could step in for a debut. Admission prices tomorrow are: Adults £9.00, OAP £5.00 and £3.00 for under-16s and the winning team will receive £5,000 prize money. A statement by Northwich Victoria appears to indicate that they will not now be supplying Chester advanced tickets to sell for the forthcoming game on Boxing Day, tickets can only be bought from Northwich direct and picked up on the day (you can imaging the chaos at the ground that is going to cause!). The reason for the change in stance is because Vics object to Chester charging 6% commission on any tickets they sell. A statement from Chester is expected after the weekend. Important Announcement Regarding Ticket Sales vs. Chester FC Following ongoing speculation about ticket sales for the home game versus Chester FC at the Victoria Stadium on Boxing Day the club feel it is necessary to clarify our position. In order to accommodate Chester FC fans, NVFC offered Chester FC the opportunity to sell tickets to their fans in advance of the game commission of tickets sold by Chester. Unfortunately Chester FC demanded 6% which we feel is unreasonable and as far as we are aware unprecedented at this level. As Chester remain resolute in their demands it seems there is no room for further negotiation. Alternatively tickets can be ordered and aid for by debit or credit card ahead of the game by phone on 01606 815200 and collected up to Friday 23rd December at 4pm or on the day of the game. We will accept order and payment by cheque by post up to and including Friday 16th December. Tickets purchased by this method will only be available for collection from the ground on the day of the game. We will not send tickets in the post due to the possibility of loss and delay as a result of Christmas post. Chester’s Boxing Day match at promotion rivals Northwich Victoria is all-ticket. Chester have been given an initial allocation of 1,200 terrace tickets and 500 seats at the Victoria Stadium. A Cheshire West and Chester Council spokesperson told The Chester Chronicle that the capacity at the ground will be raised from below 1,000 to ‘approximately 3,000’ for the eagerly anticipated match. There are no details yet of when the tickets will be on sale. Two goals from stand-in captain Michael Powell kept Chester at the top of the Northern Premier League on goal difference from Boxing Day opponents Northwich Victoria. Powell struck in each half as the Blues completed the double over their opponents and ensured that the Blues ended 2011 (FA Trophy replay permitting) unbeaten at home. The Blues are not in action now until Saturday when they travel to North Ferriby United in the first round of the FA Trophy. United have reached this stage with wins over Lincoln United 3-1, Salford City 2-0 and Conference North side Corby Town 3-2 in a replay. Once again George Horan will be missing through suspension, Jack Duggan brought in on loan to cover for Horan stayed on the bench on Saturday. With captain George Horan suspended for four matches manager Neil Young has dipped into the loan market and brought defender Jack Duggan on a one month loan from Fleetwood Town in time for tomorrow’s home clash with Worksop Town. Meanwhile loanee Joe Holt has left the club following the signing of midfielder Antoni Sarcevic.